It is a rainy dark Monday here which makes me stay inside. I am busy sorting through all of the vintage goodies I found this weekend (post detailing the flea market weekend travels to come! ), some destined for Dime Store Chic. While doing that I am watching yet another installment of the wonderful PBS Series: Mr. Selfridge starring the delicious Jeremy Piven. Mr. Selfridge was the American founder of London's famous Selfridge's department stores. He was a larger than life person who wanted to give his customers the best possible (and often most extravagant) shopping experience. I am amazed at what I am learning about turn-of-the-century retail while watching this show. I had no idea that there were no women's ready-to-wear clothes sold until Mr. Selfridge made it so, or that he determied that perfumes and cosmetics should come from the back corner of the pharmacy department and elegantly displayed on the counters as women (and men) enter the store. Fabulous! Vintage Supplies Swap: OH MY!!! I was delighted to participate in Elizabeth's vintage goodies swap with the delightful Sandy of 521 Lake Street! Sandy, bless her generous heart, sent me a box brimming with vintage goodness! I must share with you what Sandy sent. I'll let the pictures tell most of the story! I can't wait to dive in and create using these great supplies! We were instructed to decorate a cigar box and fill it with goods, but Sandy and I decided to each pack a USPS large flat rate box to the brim with vintage goods and vintage inspired treasures! Sandy must have been channeling what I love to use in crafting, as she hit the mark each and every time! I am still reeling from her generosity and can't wait to create! I love the H Mart Asian grocery a few minutes from my house. Last night I spied these snacks on the shelf. The adorable packaging lured me in a for a closer look. These packages contain 20 small packets of ramen noodle snack. The pink is artificial bacon flavor and the green is seaweed flavor. I like the slivers of seaweed in the green packet. The packets have 3 grams of fat and 150 mg sodium. Not too bad for small quickie cutie snack! I also found a display of vegetable and flowers seeds. I picked up these nasturtium seeds and will plant them today. 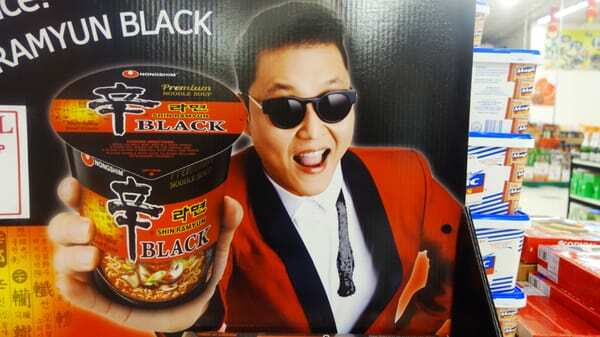 Our son discovered a new type of ramen at the H Mart. A cardboard cutout display of the Gangnam Style guy drew him in. It is an incredibly flavorful and spicy beef ramen, according to our son, and he wants more. He is a ramen expert, apparently. He does love to shop the H Mart with me. Even though we can't read the language, the adventure is a big part of the fun! This weekend I had the pleasure of shopping at an estate sale in a lovely 19th century home in my town of Falls Church, VA. This house is on the city register of historic homes and cannot be torn down to make way for some hideous McMansion--yay! The pickings at the sale weren't vast, but I did find a few goodies. But I really want to show you this house before it undergoes rennovation. Love the trio of tall wondows in the parlor. I had the pleasure of taking photos while visiting with Sue who told me her tales from her recent Texas junking. She said the folks in Texas would love these antique chairs which at this sale were going for $20 each. Upstairs tiny hall and bedrooms. Sparse pickings at this sale for sure! An interesting display case in a bedroom. And that chandelier stays with the house...sob! A sweet chalk inscription in a closet. On the back. Notice the upper balcony...sans railing! Shutters and shovels in the shed! An outhouse or teeny tiny shed. Which is it? Sue said: "don't open the door!" A teeny tiny shed! Nothing bad about that! Oh, yes. I did go to another estate sale in Arlington, VA the next day and forgot to bring my camera. I wish I did as the house was a 1920's Tudor Revival and so wonderful on the inside. However, I did find some great goods up in the attic. The staircase had a sign which read: Climb at your own risk. And I did climb! And it was worth it. Lots of vintage Christmas for future crafting. I also found one item that I am going to keep because she is just too gosh darn cute! Here is our garden from the deck. The grass (weeds!) are still struggling to fill in the bare patches. In the foreground is our pea "trough" with the shoots coming up, and behind them are 3 sweet pepper plants. Here are lettuce seedlings that I sowed like grass seed in a rusty salvaged wheelbarrow (there is a hole in the bottom for drainage). Larger lettuce plants sown in the cold frame. Hubby made the cold frame last year from windows salvaged from our house when we had them replaced. I have sown carrot seeds in between the lettuce rows. More pea shoots that I started in the greenhouse. I am going heavy on the peas this spring as fresh peas are fabulous! Clever hubby put in a third raised bed this spring for tomatoes. I bought a few plants at the garden center and I am growing more varieties of tomato from seed. To keep pesky squirrels from devouring our green tomatoes like they did last year, I have wrapped the tomato cages in black netting secured with twist ties. Basil is planted on the south end of this raised bed. The deck has more tomato plants of the bushier "cherry" variety as well spinach seedlings in the corner pig planter. And more tomatoes in net-protected cages as well as parsley and basil. Tomato seedlings I started in our passive solar greenhouse are in the small black pots. Fingers crossed that they will grow and yield tomatoes! This dear lady head vase was missing her hand, so I turned what was left into a mini pin cushion "corsage." Her hat sports lots of vintage millinery flowers, chenille bee and bird too! I also found the sweetest girl vase and her dress is now a pin cushion! Lots of vintage millinery flowers too! I live in a very international part of the country. Here life inside the Washington, DC beltway rolls along with the delightful spice of hearing languages not my own and having so many cultural experiences to choose from. The finds at local thrift shops are no exception from our local "parade of nations." Today I found a very cool vintage 1970's THICK book in Japanese (I think). The cover was intriguing enough for me to pluck the book from the shelf and look inside. It turned out to be a lavishly illustrated and encyclopedic Japanese craft book! Pretty much everything cool and crafty is represented in this large book! So many crafty delights! I don't read Japanese but I certainly can appreciate the illustrations and photos! Seriously cool crafts and designs! So very 70's! This past Friday, I attended an estate advertised only on Craigslist. The ad was written in a very high-strung manner, the author repeating several time in all caps: NO EARLY BIRDS. The cryptic directions to the sale indicated it was in the neighborhood next to mine, but the exact street address was left out apparently to discourage the dreaded EARLY BIRDS. The street was a cul-de-sac. I head over 30 minuts prior to the 10 a.m. opening time and looked closely at the houses allowing my Spidey Sense to decide which house could hold the treasures the photos on Craigslist promised. I parked in front of a likely candidate which looked more like a little old lady house than any other on the block (ie. no toys on the front lawn or satillite dishes on the roof). At 5 til 10, a woman wearing a change apron strolled out and hung a sign on a trash can by the sidewalk. BINGO! I got out of my car with four bags on my arm and greeting the woman who told me to go on in. I went in behind an old lady who nearly killed herself to get inside ahead of me and in front of an old man who might have been her spouse. And for about 10 blissful minutes, it was just the three of us in this house packed full of treasures. There was another sale very close by starting at the same time and highly advertised by an estate sale company. My guess was that was where the majority of shoppers were hanging out. Better for me. In about 15 minutes I had filled all four bags and the lady running this family run estate sale allowed me to put my bags on the couch with sold signs she had made on notebook paper. More people came in until the house got crowded and I had filled 2 more bags I found in the house. I ran into friends who teased that I had gotten all of the good stuff first, and perhaps I did! I filled the back of my car including the floor of the back seats all for under $80! This sale was great and most of the prices where so cheap! The woman running the sale, an ultra chatty, boisterous sort, grew up in the house. As things in the house came to her to be purchased, she would loudly comment on pretty much every item and on a few occassions she would not allow an item to be sold. This caused the line to move so slowly, but at prices as good as I got, I would have waited twice as long. Seriously! That is a fabulous metal tree stand I found for $2.00! And the eary 1960's globe was $1.00--yessss! The sale was so good, I went back that same afternoon when I had it to myself, and got to pull through unexplored cupboards and drawers with the permission of the lady running the sale. I filled up two more bags and had a nice long chat with her about her growing up in the neighborhood. In turn she said if she found anything in the attic, which was wasn't completely cleaned out, she would set it aside for me. A huge early 1960's school wall map! It has metal framing on the top and bottom and light lamination. The colors are so lovely! And believe it or not, in addition to the map, I filled three more bags of goods! Many of those goods are covering the studio floor awaiting pricing as Suzy and I are preparing for a really fun show in Richmond, VA June 15-16: The Vintage Home Market! It is a juried show that combines handmade vintage style goods and vintage goods. We will have both in our booth! I will give you more details as the event draws near! I try to put new items in Dime Store Chic every week to keep the shop fresh. That means constantly searching for those special treasures at local thrift stores and weekly estate sales. It takes time and effort but I love what I do so very much that it is more pleasure than work, in fact it is not work at all! Lately several thrift stores have closed and while that is a bummer, it causes me to step up my game and search the remaining thrifts on a more frequent basis as well as driving that extra mile to a promising estate sale. This week I found some interesting and charming books for reasonable prices so I can offer them on Dime Store Chic for reasonable prices. If you are a "South Paw" (lefty) here is a big lavishly illustrated with great how-to's vintage 1970's needlepoint book for you! A 1951 "The Three Little Puppies" real photo book! I have no idea how the photographer got these pups to pose (and yes, they are alive!). A very lovely large-size "Mother Goose and Nursery Rhymes" by Marguerite de Angeli from 1954! The illustrations are bliss! A very fun Raggedy Ann and Fido Little Golden book in nice shape! Again, the illustrations are so cute!